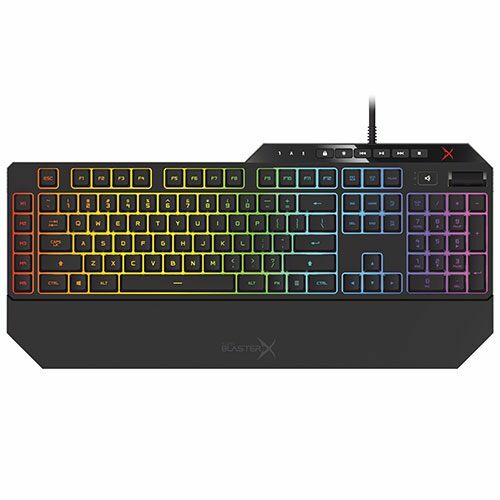 Creative’s Sound BlasterX Vanguard K08 is a mechanical gaming keyboard to consider if you’re looking for tons of responsiveness, quiet but tactile feedback, dedicated media keys and fully customizable RGB lighting. However, there’s a lot of competition in this particular category. Does the Vanguard K08 do enough to warrant your consideration over the competition? Let’s take a look! 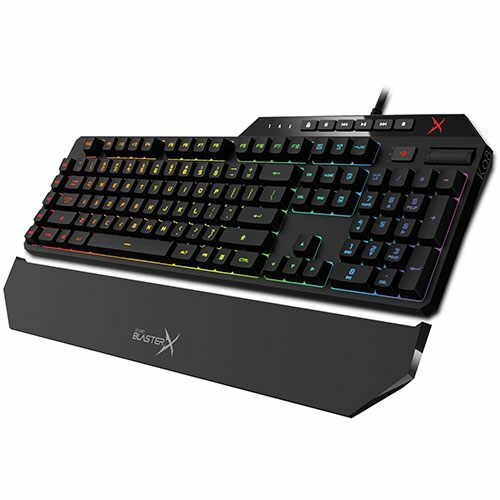 Creative’s Sound BlasterX Vanguard K08 mechanical gaming keyboard is definitely a keyboard to keep in mind if you’re looking for tons of responsiveness, a quiet but tactile feedback, dedicated media keys and customizable RGB lighting. 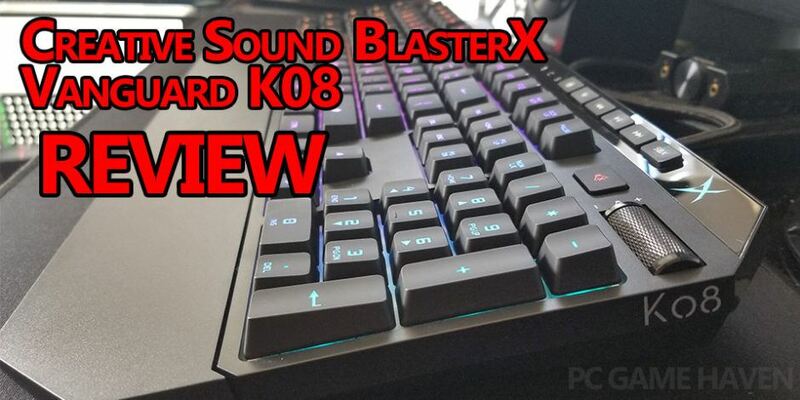 The Sound BlasterX Vanguard K08 gaming keyboard was recently sent to me for review by Creative, since using it I’ve almost fallen in love with their PRES mechanical switches which were co-designed with OMRON, the build quality, and the backlighting. Everything about the Vanguard K08, with my unit at least, screams quality. 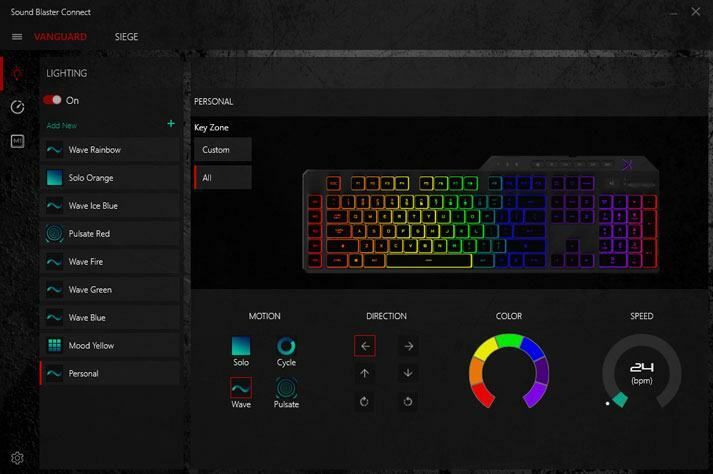 From the feel of each key press to the vivid RGB backlighting and the dedicated media keys. The biggest flaw I’ve found is relatively minor in the scheme of things, this flaw is that the wrist rest doesn’t attach securely and simply moving the keyboard a few inches can cause it to detach – this is annoying but not a deal breaker in my opinion. Just a note, to customize the Aurora RGB backlighting, you’ll have to download “Sound Blaster Connect” from Creative’s support website. It actually took me a few minutes to find the software as it’s not really listed anywhere outside of the drivers page, but for your sake I’ll leave a link here. The overall design of the K08 is great. The matte finish throughout the entire keyboard gives it a nice smooth feeling and it doesn’t seem to attract grime or dust like some other keyboards are notorious for. The RGB backlighting is bright and the colors are definitely vivid. That being said, the software to customize the backlighting definitely leaves something to be desired if you’ve ever used Razer’s software. That’s not to say that Creative’s Sound Blaster Connect is bad, there just aren’t as many options as I’d hoped to see. Pretty much everything else about the K08’s design is awesome, except one thing. The way the wrist rest attaches to the keyboard. It simply does not attach securely and moving the K08 even slightly can cause the rest to detach. To some this might be a major flaw but to others it won’t matter in the slightest. Something to keep in mind either way. In terms of design, Creative nailed it with the Vanguard K08. Not only does it feel like a quality keyboard, but it looks the part as well. The mechanical keys feel smooth yet offer a tactile feedback that’s not excessive nor too light. The backlighting is easily adjustable from very bright to barely on at all and of course everywhere in between. 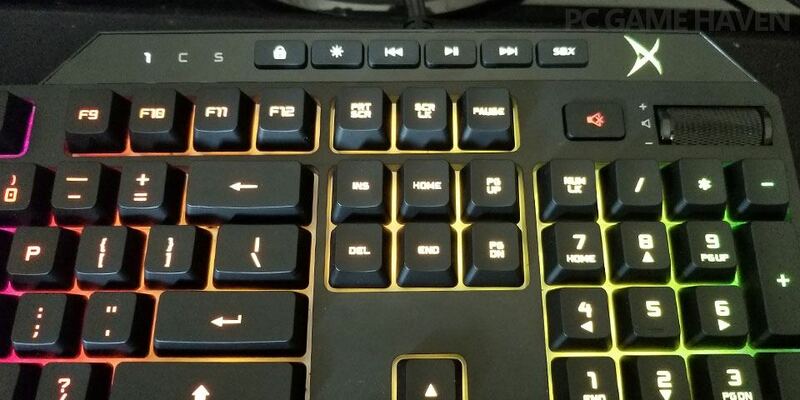 The first order of business when determining how a mechanical keyboard performs is testing the switches. Who would have thought? After thoroughly testing Creative’s PRES switches on the Vanguard K08, I can easily say that I’m a huge fan. They feel significantly more comfortable to use than Razer’s Green switches and very much on par with Cherry MX Browns. If I had to make a choice between the Vanguard K08 and the BlackWidow Chroma, it would have to be the Vanguard K08. With mechanical switches aside, the rest of the K08 performs just the way you would want it to. Within the Sound Blaster Connect app, you can easily change how the K08 will react in terms of repeat delay, polling rate, and repeat rate, making it an all around great keyboard for all types of gaming. If you’re in the market for a new mechanical keyboard and you’re wanting to step outside of the typical Cherry MX keys, Creative’s Vanguard K08 is definitely a keyboard to keep in mind. Not only does it use great mechanical switches that are very comparable to Cherry MX Brown, but the overall quality of the construction is great as well. The only major downside I could find was how the wrist rest attaches. All-in-all, this is solid keyboard if you don’t mind paying a premium price. There are other options that come in a lot cheaper and they might be worth considering first. 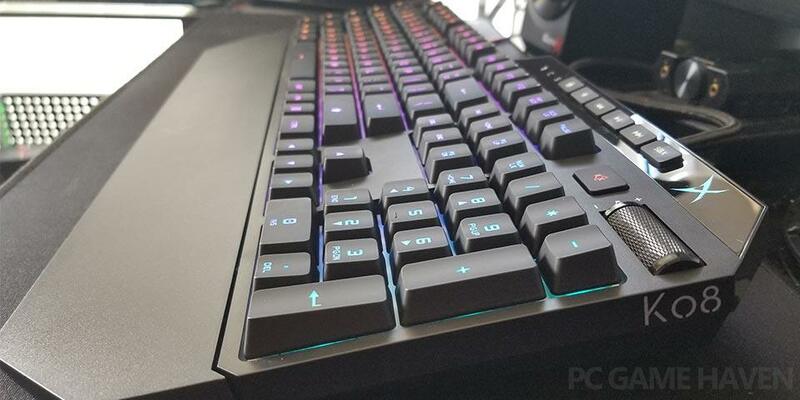 If you’re looking for a keyboard with a more reasonable price point, check out the top 5 gaming keyboards under $100.